Yesterday afternoon was hot, sunny, and dry in southern California, and it was as great a time as any to draw attention to climate change and demand action on it. 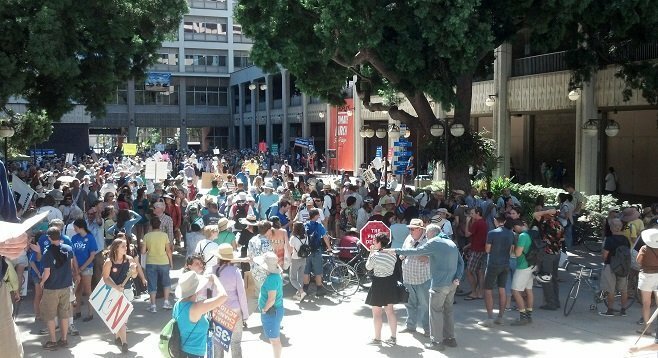 I was one of 1,500 people who participated in the People’s Climate March and rally in San Diego, which started at City Hall and the Civic Center, went down Broadway past the train station, and ended at the County Administration Park. It was exciting and inspiring to be involved in what may have been the largest climate protest in history. 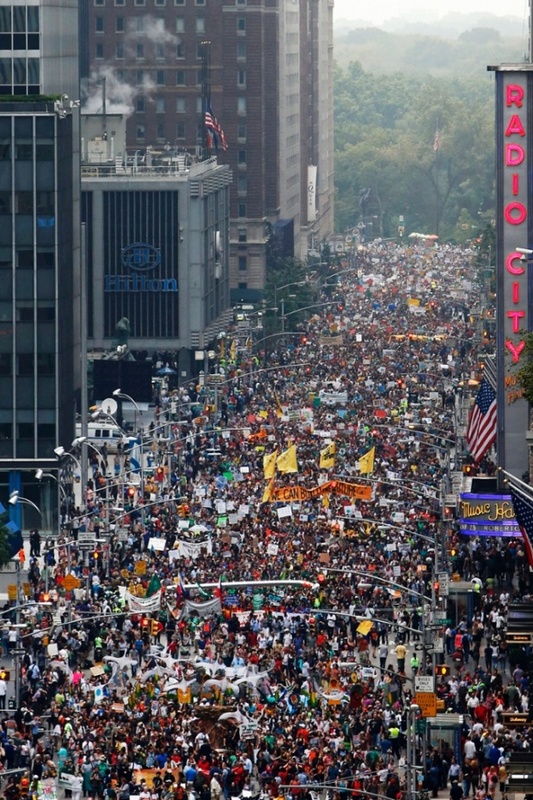 At least 300,000 people participated in the march in New York, where the UN climate summit is taking place. According to a speaker for SanDiego350, which was one of the groups organizing the local events, there were marches and rallies in over 3000 cities around the world. They were also widely reported in the media, for example in the New York Times, LA Times, Guardian, and Democracy Now. I’m not a good photographer, so I grabbed the photo above from the SD Reader and the NYC photo below came from the Guardian. I’m sure there were a few differences between the people participating in the SD and NYC protests, as I saw many people wearing flip-flops, heard chants of “¡Si Se Puede!”, and saw a few Mexican wrestler masks too. From what I could see, it was a very diverse crowd in terms of gender, race, class, and age. Climate change is now more than just an environmental issue—many people from unions, religious groups, and students and teachers attended too. People held signs and yelled chants saying a variety of things: demands for clean energy, green jobs, climate justice, and an end to fracking were common. As I mentioned in my previous post, many Californians are concerned about drought and water policies too, and I saw a few signs about these issues as well. Although we can see widespread support for action on climate change, it’s clear that conservatives and Republicans didn’t show up; climate change has become an increasingly partisan issue in the US over the past few years. Capretz and Gloria outlined their Climate Action Plan, which includes ambitious goals in five areas: energy and water efficient buildings; clean and renewable energy; biking, walking, and transit; zero waste; and climate resiliency. From what I can tell, their emphasis is on the first three prongs. The plan would cut San Diego’s greenhouse gas emissions by 15% by 2020 and nearly half by 2035. More than half of San Diego’s GHG emissions come from transportation, which is why investment in public transit, bike- and pedestrian-friendly areas, incentives for car-pooling, and other related measures are important. However, the plan already faces some resistance from business groups, who only approve of voluntary, incentive-based programs (but not mandatory measures) to get property owners to pursue upgrades to improve buildings’ water and energy efficiency. Mayor Kevin Faulconer is preparing to release his own version of the plan. If it’s watered down, I think he can expect San Diegans to organize more climate marches in the future. At the UN climate summit, no binding agreements were made, though there were many modest commitments. If successful, the efforts to end deforestation by 2030 will be an important step.